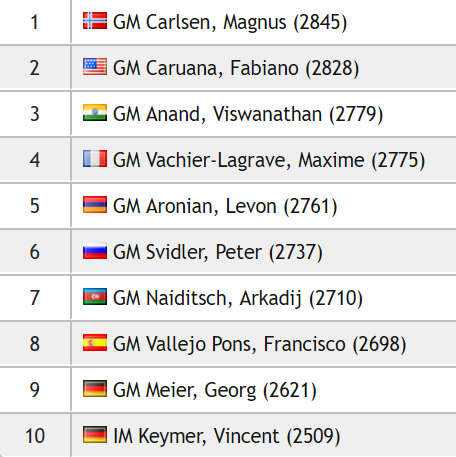 Magnus Carlsen completed a brilliant 2990 performance in the Gashimov Memorial in Shamkir by beating Alexander Grischuk in the final round to end on 7/9, a full two points ahead of Ding Liren and Sergey Karjakin. Grischuk said his opponent played “amazingly well” in what was a third phenomenally good win in a row, taking the World Champion to 2860.8 on the live rating list, heights no-one else has ever reached. His personal record is 2889.2, and he can try to get closer to that when he plays the GRENKE Chess Classic in 10 days’ time. As I told him after the game, I want to fix my last place, so today is not the day of my comeback! I think the paradox of today may be that the only one who will really fight will be the one who doesn’t have to fight any more, and Magnus will be the only one to really go for it! 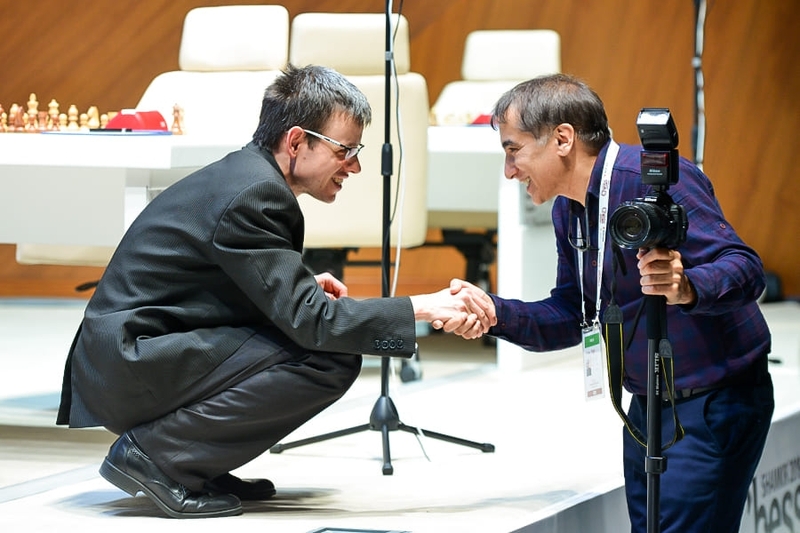 As Giri also predicted Mamedyarov-Karjakin soon ended in a draw, and although Anand-Topalov and Navara-Radjabov were tense fights they were also drawn in 31 and 40 moves respectively. The day was all going to be about one man. There are different ways of winning super-tournaments. 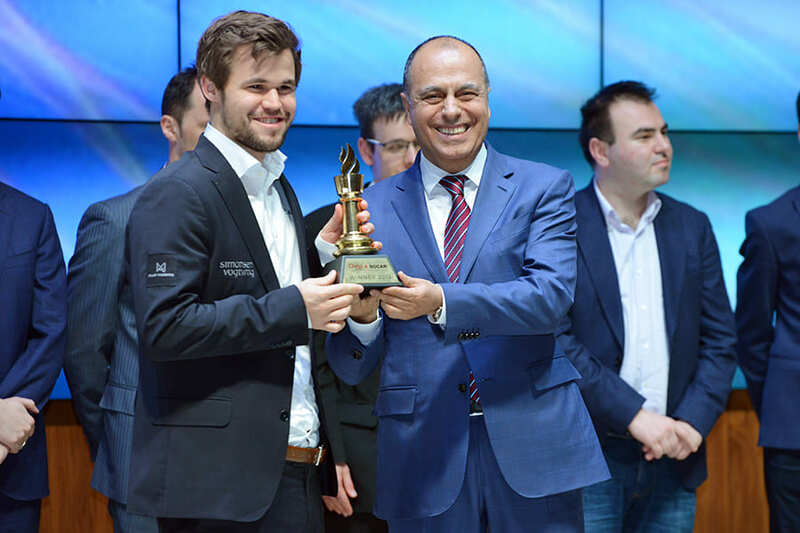 Last year, for instance, Carlsen also won in Shamkir, but it was a tournament where it took four rounds for any player to win a game. 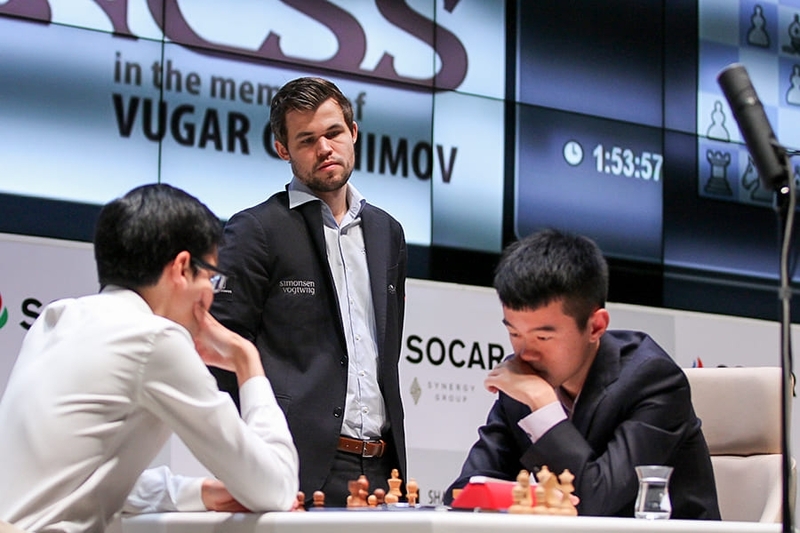 Magnus eventually won three, against Wojtaszek, Topalov and Giri, but none of the games were truly memorable, and the final round was a damp squib of a draw against second-placed Ding Liren. 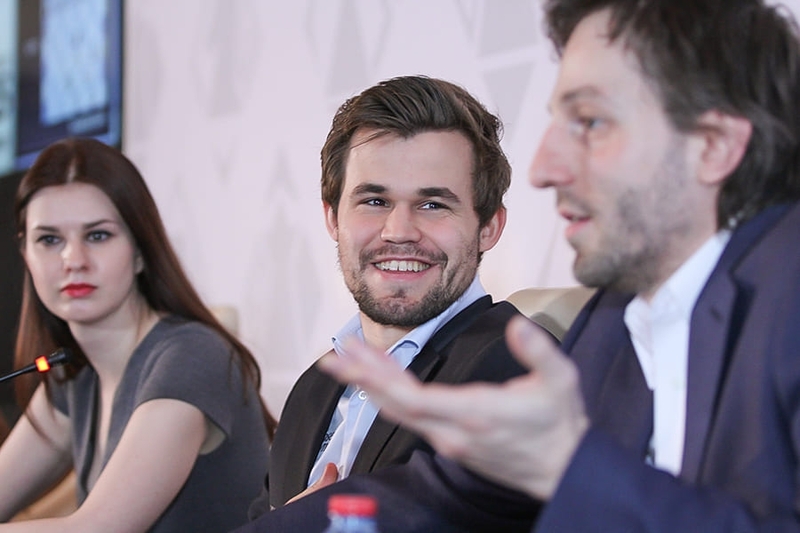 Fast forward a year and Teimour Radjabov could described Carlsen’s performance as, “a really stellar level of play, really unique,” and that comment came during the final round before the grand finale of Carlsen-Grischuk. We got to see the World Champion’s mood early on, where he played the 4.d3 Anti-Berlin rather than giving in to the temptation of making an easy draw in another line. That seems harsh given that, at least on a low depth, it’s the computer’s first choice in the position, but the way the game went emphasized the weaknesses it created - right up to the final position when a backward pawn on a6 is about to fall. 28…c5 just loses to 29.Be3, more or less. After other moves it’s difficult, but probably still defensible. 32…Nb8!, with the knight coming to c6 next move, seems to hold everything together, although White remains better with his powerful bishop pair. 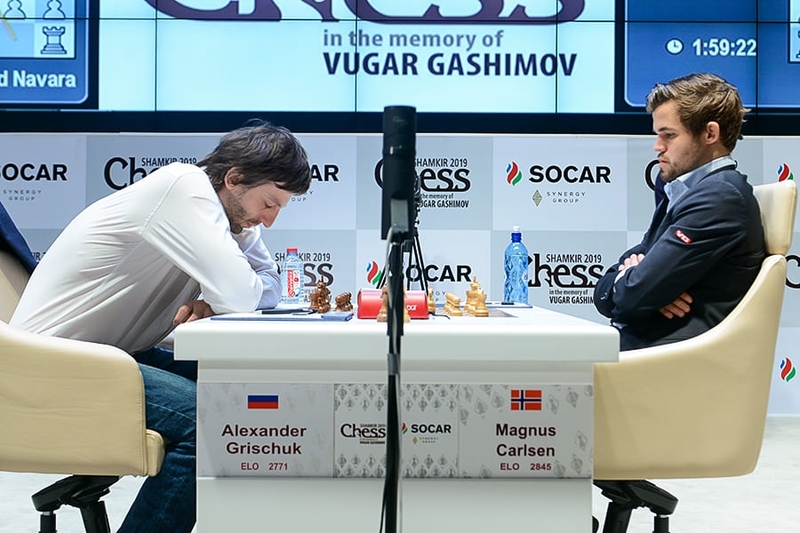 Instead Grischuk, in the same time trouble as Carlsen’s previous two opponents, went for the bold try 32…f5?! 33.Bxf5 Nf6?! 34.Kf3! Nd5 (34…Nh5 runs into 35.Bxc5! ), only to be rocked back on his seat by 35.Rd2! 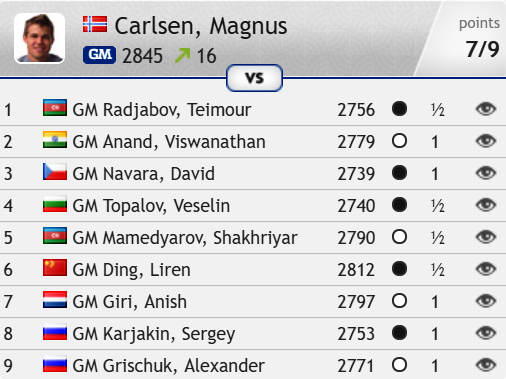 I think Magnus played just amazingly well today, because for me it was not clear at all. I suspected it’s bad, but I don’t know, because there are pins, counter-pins, mating nets, sometimes this is good for Black, sometimes it’s good for White, and even after 34…Nd5 I thought I should be in trouble, but 35.Rd2 was a complete surprise for me. Because if not Rd2 actually ok, I’m clearly worse, but if e.g. Bd2, just takes and Nc7 – it’s nothing special. Grischuk used almost all his remaining time before playing 35…Rd8 36.Be4 Red7 37.Red1 Nf6 38.Rxd7 Nxd7 39.Rd6 and resigning, with 20 seconds left on his clock. 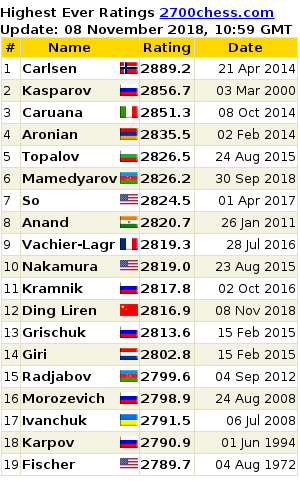 In 2015 Magnus went into Shamkir on the back of a 2863 rating, but during his win at the same event in 2014 he set his personal best live rating of 2889.2 after beating Hikaru Nakamura in the second round. That personal record is of course also a world record! Jan Gustafsson will be back from crushing the world in Thailand to commentate live from the venues (Karlsruhe and Baden-Baden) with Peter Leko. Radjabov said it had been a privilege to play in a tournament containing such gems, and it’s also been a privilege to watch and write about it! We hope you enjoyed the coverage and stay tuned for many more big chess events in the coming weeks.